Is the smallest Olympus CSC as easy to use as it promises? This camera will suit those looking for a high quality compact system camera that is simple to operate, but will be less suited to experienced photographers who may require more customisation and direct control. Designed for the casual snapper who doesn't want to compromise on image quality, the Olympus PEN Mini E-PM1 is similarly specified to contemporary Olympus PEN models, but with an emphasis on ease of use and simplicity of design. Compact system cameras (CSC) like this have exploded in popularity in the last year or so, due to their promise of high quality images and the flexibility of interchangeable lenses without the bulk of a DSLR. The compact dimensions are possible because the reflex mirror used in a DSLR camera is absent, enabling the lenses to be placed much closer to the image sensor. The design also enables a much larger image sensor to be used than would typically be found in compact cameras. Having a larger image sensor should result in less noise at higher sensitivities, because there's more surface area per pixel to capture light to form an image. 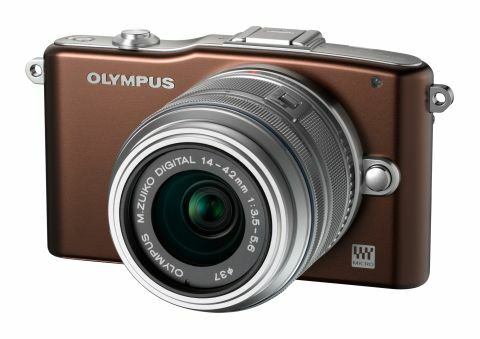 Priced at around £450 with the standard 14-42mm kit lens and available in a range of different colours, this PEN is the cheapest and most compact of three new additions to Olympus' range of compact system cameras, the other two being the PEN E-P3 and the PEN Lite E-PL3. Its rivals include the Panasonic GF3 and Sony NEX-C3. The overall design of this camera differs to other cameras in the PEN line-up, since manual exposure overrides are largely tucked away into the menu system, providing a user experience particularly suited to pointing and shooting. This doesn't mean manual overrides aren't possible, though, and a comprehensive range of creative exposure modes are provided. At the heart of the Olympus PEN Mini E-PM1 lies a 12.3MP Live MOS sensor with a sensitivity range from ISO 200 to ISO 12800, which should be perfect for low-light conditions. A new image processing engine, introduced in all three recently released Olympus PEN cameras, promises to keep noise levels low, even at high sensitivity settings, as well as aiding processing speed and video quality. The low weight of 265g with a battery and memory card installed, and a slim profile, should aid portability. Olympus has devised a 35-point autofocus (AF) system that was the fastest to obtain focus among its peers, when tested in June 2011. AF certainly seems very snappy, and accurate enough for use with wide aperture lenses. One of the major benefits of a compact system camera is that the lens can be swapped over to suit the application. The Micro Four-Thirds system has one of the largest range of compatible lenses on offer of any compact system camera. With ease of use being the main ethos behind the Olympus PEN Mini E-PM1's design, a reduced selection of buttons is provided, enabling access to the most commonly used functions, such as video recording, exposure compensation, flash, drive and focusing modes. Everything else is tucked away into one of the simply laid-out menus. Common overrides can be easily accessed by pressing the OK button and other settings via the menu button. This design approach will certainly suit snap shooters well, who may rarely override the camera's automatic exposure, but may take a little getting used to if you're more at home with manual exposure control. A live guide feature has also been included, which explains each function in the menu as it is selected. A 3-inch LCD screen with a resolution of 460,000 dots provides the view for composing images and videos. The screen has an aspect ratio of 16:9, which is great for recording wide-screen videos, but not so great for taking images in the standard 4:3 aspect ratio. Much of the screen is wasted and black bars fill either side of the screen. A highly reflective acrylic cover protects the screen. Unfortunately because it's so reflective, it also makes the screen difficult to see clearly in bright conditions. Since the electronic viewfinder is optional, this could be a major issue for some. The screen is incredibly difficult to see with the sun behind you, and guesswork may even become the last resort when composing shots when the screen can't be shaded easily. Under more favourable conditions the screen is bright and clear and the menus easy to navigate, with pleasing animated flourishes as you select various items. A decent selection of scene program modes and custom art effect filters are provided, which offer a one-touch fix for more creative-looking effects. The art filter menu includes effects to reproduce various popular looks, including Soft Focus, Pop Art, Grainy Monochrome Film, Pin Hole Camera, Dramatic Tone and a Diorama effect, which reproduces the shallow depth of field effect of a tilt-shift lens. The effects applied are of good quality and can be used to quickly enhance your images. Image stabilisation is provided via a sensor-shift mechanism, which means all Micro Four-Thirds-compatible lenses will benefit from the effects of stabilisation. This should help with photographing in low-light conditions. Full 1080p HD video recording is possible in the popular AVCHD format for clips lasting up to 29 minutes. Footage can also be recorded at lower resolutions in Motion JPEG format, although clips are limited to seven minutes for this recording standard. Video footage is very smooth and detailed, and can be played on an HD TV directly from the camera via the supplied HDMI connection. Olympus provides an optional EMA-1 external microphone adapter to enable a mic to be attached via the AP2 port below the hotshoe. This port also accepts the optional electronic viewfinder and the supplied external flash.